my life.Blood for papa.Mr.Borrell,sir,I don't want to kill anymore.No sur,no more but I must,'honour thy father. 'I want to make love to the world.I love people.I don't belong on earth.Return me to yahoos.To the people of Queens,I love you.And I want to wish all of you a happy Easter.May God bless you in this life and the next.I say goodbye and goodnight.Police:Let me haunt you with these words;I'll be back!I'll be back!To be interrpreted as-bang,bang,bank,bang-ugh!!
" I have asked you kindly to stop that dog from howling all day long,yet he continues to do so.I pleaded with you I told you how this is destroying my family.We have no peace,no rest.Now I know what kind of a person you are and what kind of family you are.You are cruel and inconsiderate.You have no love for any other human beings.Your selfish,Mr.Carr.My life is destroyed now.I have nothing to lose anymore.I can see that there shall be no peace in my life,or my families life until I end yours." gloomy.Dad,the world is getting darker now.I can feel it more and more.The people,they are developing a hatred for me.You wouldn't believe how much some people hate me.Many of them want to kill me.I don't even know these people,but still they hate me.Most of them are young.I walk down the street and they spit and kick at me.The girls call me ugly and they bother me the most.The guys just laugh.Anyhow,things will soon change for the better." "I must slay a woman for revenge purposes.To get back at them for all the suffering they caused me." "The demons never stopped.I couldn't sleep.I had no strength to fight.I could barely drive.Coming home from work one night,I almost killed myself in the car.I needed to sleep...the demons wouldn't give me any peace." Due-to two men(Carr & Glassman)coming forward with personal letters written to them from a David Berkowitz,officers could compare the writing to that of the murderer's-and it presented a complete match.Officers and Detectives set up a STING operation outside of Berkowitz's apartment building,then,on early August 11,1977-Berkowitz emerged from the building carrying a paper bag(which later was revealed to have been holding a .44 pistol inside it).Berkowitz got into his Ford Galaxy and the police & Detecitves surrounded the car-he was placed under arrest. 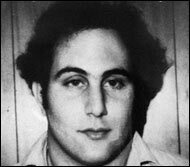 Berkowitz was sentenced to 365 years in prison,and up for parole in 25 years.His first two paroles were held in both 2002 and 2004,but he was denied due-to the fact the parole board felt that he hasn't yet come to grips as to why he murdered those people.He will be up for parole once again in June of 2006.He is a role model prisoner-good behavior;helping other inmates;is a Chaplin's clerk;completed a 2-year degree from NY University;and has completed many rehab programs.